Antigo Area Community Food Pantry July 25th 11am-1pm (Wednesdays) & July 27th 1pm-3pm (Fridays), 2120 Progress Blvd., Antigo (715) 623-1103. Elcho Area Community Food Pantry July 23rd & July 30th 10:30am-12:30pm (Mon. ), July 25th 4-6pm (Wed.), 11224 Antigo St., Elcho. Call (715) 610-5886 for more information. Grill Masters Wanted for the Northwood’s Triple Crown BBQ Contest. Win $1,500 in prize money and more. The event is at the Langlade County Fairgrounds on August 11th. 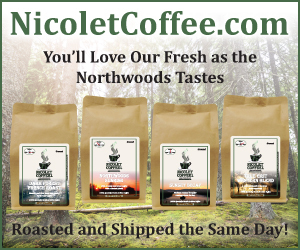 Log on to NorthwoodsTripleCrown.com for complete details. Shawano County Library Scholastic Book Fair July 23rd–28th Shawano County Library, 128 S. Sawyer St., Shawano. The Shawano County Library Scholastic Book Fair will be open during regular library hours. For more information, please call 715-526-3829 or go to www.shawanolibrary.org. Mahjong at the Langlade County Senior Center July 23rd 1-4pm Langlade County Senior Center, 1225 Langlade Rd., Antigo. Come and learn how to play. For more information, please call 715-627-6632. Music in the Park – Antigo Community Band (Variety) July 23rd Food & pies starting at 5:30pm; concerts start 6:30pm. City Park West, 700 block of Aurora St., Antigo. Bring your lawn chairs & listen to the Music in the Park! Concerts held every Monday & Thursday, June-August. In the event of severe weather, concerts are held at the Heinzen Pavilion in Peaceful Valley. Free admission. For more information, please call 715-627-1014. Monday Night Women’s Road Bike Ride July 23rd & July 30th 5:30pm Langlade Hospital, 112 E. 5th Ave., Antigo. The Women’s ride meets every Monday evening at 5:30pm at the Langlade Hospital parking lot off Hwy F. Everyone is welcome. The rides take place through August 28th. For more information, please contact Mary Jo at mjfilbrandt@gmail.com. Coffee Klatch for Seniors July 24th & July 26th (Every Tues. & Thur.) 9-11am Langlade County Senior Center, 1225 Langlade Rd., Antigo. Come and enjoy some coffee and conversation with others. For more information, please call 715-627-6632. Strong Bones with Kathy July 24th & July 26th (Every Tues. & Thur.) 9-10am Langlade County Senior Center, 1225 Langlade Rd., Antigo. Strong Bones is an ongoing strength training program designed to help adults become or stay fit, strong & healthy. Individuals will improve muscle strength, bone density, self-confidence, sleep and vitality. Also, participants have shown a decreased risk of diabetes, heart disease, arthritis, depression & obesity. Classes are offered for an hour, twice a week. Pre-register by calling the Aging and Disability Resource Center at 715-627-6232. Tuesday Morning Road Bike Ride July 24th 9am Antigo Public Library, 617 Clermont Street, Antigo. This bike group meets every Tuesday morning at 10:00am in the spring and 9:00am in the summer. Meet at Antigo Public Library parking lot. Shipwrecked Vacation Bible School July 24th-26th 9-11:30am Risen Savior Lutheran Church, Hwy. 32, Mountain. All children 3 years old and up to entering the 6th grade are welcome to attend. Always free. Bring a friend. Register by going to www.trinityrisensavior.com or call 715-473-5633. Last minute walk-ins welcome. Langlade County Senior Center Lunch Bunch July 24th 11:30am M&L Truck Stop Restaurant, N2297 Hwy. 45 S, Antigo. Join us for lunch and socialization. Library Gaming Club July 24th 3:30-5pm Antigo Public Library, 617 Clermont St., Antigo. Come and play games! Multiplayer video games and board games both classic and modern. For more information, please call 715-623-3724. Developing A Community Solution – Langlade County’s Response to Illicit Drug Abuse July 24th 6:30pm White Lake School commons, 405 Bissell St., White Lake. Langlade Co. has experienced an unprecedented increase in the abuse of methamphetamine in our community. This is not a unique situation, however, creating an effective solution to this problem is challenging. The time is now to come together as a community to be part of the solution. The evening will include a brief presentation of the nature of the problem, followed by an interactive discussion of the potential responses that Langlade County can undertake. All community members are encouraged to attend. Langlade County Fair July 25th-29th Langlade Co. Fairgrounds, 1633 Neva Rd., Antigo. Bring your family & enjoy a day of quality family time. Stroll through over 5000 4-H exhibits, watch one of the many animal shows, witness fabulous entertainment on the two free stages, & strolling entertainers on the midway. There are two buildings full of vendors showcasing their services & products along with plenty of food & drinks to enjoy. Over 30 rides for young & old, sprint car racing, demo derby & tractor pulls too. For more information, visit langladecountyfair.com. Blood Pressure Clinic July 25th 9am-Noon Antigo Fire Department, 700 Edison St., Antigo. For more information, please call Lisa Vollmar at 715-350-7315. Immunization Clinic July 25th 9am-4pm Langlade County Health Department, 1225 Langlade Road, Antigo. The immunization clinic is available to provide childhood immunizations & adult vaccinations. The vaccinations are FREE to children 2 months – 18 years of age if you have Medical Assistance or no insurance. Adult vaccinations are available some with a minimal fee or FREE if you have MC or MA. Contact the Health Department at 715-627-6250 for more information or to see if you are in need of any vaccinations. Family Folk Music July 25th 10-11am Prairie River Middle School auditorium, 106 Polk St., Merrill. Fox and Branch is a Milwaukee-based duo that has won four Parents’ Choice awards. They will invite audience members to sing along and dance in the tradition of the great Pete Seeger. This concert will be followed by more rockin’ music activities and an ice-cream treat at the library courtesy of Culver’s. Admission is free. For more information, please call Carolyn Forde at 715-536-7191. Preschool Story Time July 25th 10:30-11:15am Antigo Public Library, 617 Clermont St., Antigo. Join us for story time at the Antigo Public Library! This is a great way for kids who haven’t started school yet to meet & socialize with peers. Every week we’ll read 2 or 3 books together as well as doing some songs & movement. We also do a simple craft or coloring page that helps kids develop creativity & motor skills, & occasionally (attendance permitting) other activities such as parachute play. This event is geared towards preschoolers, but older or younger kids are welcome to attend as well. Bingo at the Langlade Co. Senior Center July 25th 1-2:30pm Langlade County Senior Center, 1225 Langlade Rd., Antigo. The Story of Scent Class – from Cleopatra to Chanel July 25th 3-5pm Birnamwood Branch Library, 337 Main St., Birnamwood. The class covers the fascinating story of perfumes from ancient times in Greece, Rome and Egypt to modern aromatherapy. Explore the science of the sense of smell, how famous perfumes are made and learn how essential oils are found in today’s products. The class will also learn how to make a body scrub and natural home cleaner. Handouts include recipes and aromatherapy information. Pre-registration is required. Please call 715-449-3120 to register. United Church of Christ Men’s Club Dinner July 25th 4-7pm The Jack Lamar Memorial/Elcho Community Pavilion, N11283 Dorr St., Elcho. “Beef Tenderloin Steak Dinner”, potatoes au gratin, green beans, salad bar, dessert and coffee! Bar opens at 4pm, serving food at 5! Cost is $16.00. For more information, please call 715-275-3134 or 715-216-1344. Wednesday Night Road Bike Ride July 25th 5:15pm Langlade County Courthouse, 800 Clermont St., Antigo. The road biking group meets every Wednesday evening at 5:15pm at the Langlade County Courthouse. Bike along as often as you like. For more information, please call Brady at 715-623-3036. Food Safety & Sanitation Certification July 25th 5:30-9:30pm Northcentral Technical College, 312 Forrest Ave., Antigo. This state approved course prepares you for the National Restaurant Association Certification examination from the Department of Health & Social Services by providing managers & employees in the food-service industry the knowledge of food-safety procedures. By taking this state approved course & passing the certification examination, you will be eligible to apply for your Certified Food Manager License from the Department of Health & Social Services. The National Restaurant Association certification examination is the second night of the course. Textbook required. The cost is $89 + book. For more information, go to www.ntc.edu/ce or call 715-623-7601. Music on the River July 25th 6pm Veterans Memorial Park, Tomahawk. FREE live music series at Veterans Memorial Park. Bring your chairs, picnic dinner and your favorite beverage and enjoy music along the Wisconsin River. For more information, please call 715-453-5334. Merrill City Band Concert July 25th 7-8pm Normal Park, 500 N. Center Ave., Merrill. Enjoy the music of our local talents from the Merrill City Band. 7th Annual Forest County DAV Biker Rally & Ride July 26th-28th Pack Em Inn, 216 N. Lake Ave., Crandon. This amazing three-day event will feature a two-day ride, food, drinks, meat raffles, best poker hand payout and three days of live entertainment! New this year we will raffle a 2018 Sportster!! This year Pack Em Inn, Community Connect, LLC, and Forest County DAV Chapter 43 have partnered to make this event an even bigger success, raising funds for a great cause, our disabled American veterans and their families. We want you to be a part of this event! For more information, please call 715-478-3850. Play & Learn July 26th 9:30-11am N4013 Hwy. 45, Antigo. Play & Learn is a weekly play group program for parents, caregivers & children from birth to age 5. Staff will provide a parent lesson, an activity for parents & children to do together. The activity will build skills for school readiness & milestone achievement. Quarterly Ages & Stages questionnaires are made available to parents & caregivers to assist families in helping their children to reach age based development milestones. Join the conversation on Facebook – Northwood’s Family Resource Centers http://www.facebook.com/NorthwoodsFRCN. For more information, please call 715-627-1414. Cards, Dominoes & Game Playing Program July 26th (Every Thurs.) 1-4pm Langlade County Senior Center, 1225 Langlade Rd., Antigo. Have you been looking for someone to play cards & games with? Here is your chance to meet others and share your love for cards, dominoes & games. For more information, please call 715-627-6632. Gazebo Nights at Normal Park July 26th 5-8pm Normal Park, 500 N. Center Ave., Merrill. Come and enjoy the band Winchester at 5pm and Broken Arrow Band at 6pm. Mountain Bike Group Trail Ride July 26th 6-7:30pm Antigo Single Track Mountain Bike Trail, N1985 Dump Rd., Antigo. Ride the NEW Dump Road Mountain Bike Trail at the Antigo Single Track Mountain Bike Trail on Thursday, July 26, August 2, and August 9! Meet in the parking lot by the trailhead. This is a no drop ride. Bring Bike, Helmet, water, and a sense of adventure. For more information, please call Dominic Frandrup at 920-257-7200. Northwood’s Summer Art Tour July 27th-29th 10am-5pm Northwood’s Galleries & Studios. More than 30 of Northern Wisconsin’s finest artists will open the doors of their studios and galleries giving a unique behind the scenes opportunity to witness the creative process in the natural settings which provide their inspiration. The self-guided tour winds through some of the prettiest back roads and byways in Vilas, Oneida, Iron, Langlade and Lincoln Counties. Art lovers will not only meet painters, potters, photographers, furniture makers, wood carvers, jewelers, glass and fiber artists face to face on their journey, but also enjoy the process of discovery and potential for unexpected delight. Color brochures & maps are available at local businesses, area galleries & chambers of commerce. For more information please contact Arlene Bozicnik at 715-385-3334 or go to www.northwoodsarttour.com. Polish Heritage Days July 27th-28th Armstrong Creek. The Friday night polka returns. Enjoy dancing to The Cynor Brothers Polka Band from 7-11pm. The crowning of the festival king and queen will also take place. On Saturday, activities begin at 11am with a Polish mass at the St. Stanislaus Kostka Catholic Church. After the mass, a parade proceeds from the church to the town park. Throughout the day the park will bustle with activities for the young and old alike, including games for the kids, craft booths, car show and petting zoo. The smell of polish foods – pierogi, polska kielbasa, kraut, Golabki, Kluski z Kapusta and bakery – will fill the air throughout the weekend. Polish Heritage Days is sponsored by Citizens for Armstrong Creek, Inc. Proceeds go to the betterment of the community. The Reverend Raven & the Chain Smokin’ Altar Boys July 27th 8-10pm Three Lakes Center for the Arts, 1760 Superior Street, Three Lakes. Bringing crowds to their feet at the hardest to please & sophisticated night clubs in the Midwest, Reverend Raven & the Chain Smoking Altar Boys play traditional blues, straight up with a big dose of passion. With smoking grooves, served up with hot harmonica & smooth stinging guitar they play original songs peppered with nods to Slim Harpo, Little Walter, Jimmy Rogers, Billy Boy Arnold, Junior Wells & the three Kings. Tickets are $25 for adults $5 for children. For more information, go to www.tlcfa.org. Antigo Farmer’s Market July 28th 8am-Noon Heinzen Pavilion, 603 6th Avenue, Antigo. All produce is locally grown by the vendor who sells them. Shopping at the Antigo Farmer’s Market is a great way to get local, in season food, and make connections with the people that grew it. The Taj Mahal 3rd Annual Honor Flight Benefit July 28th 8:30am The Taj Mahal, 1540 Pueblo Drive, Rhinelander. At 8:30am, we’ll have a 3-4 hour motorcycle ride. Meet at the Taj. There will be a bake sale all day. From noon to 4pm have smoked pork & chicken, beans, potato salad for $5 a plate. At 12:30pm raffles will begin and from 1-5pm there will be music by Bobby Vintage. All proceeds go to the Honor Flight Program. Contact Dawn at 715-369-1055 with any questions. Black Squirrel Scurry Triathlon July 28th 8:30am-Noon. Merrill. The Black Squirrel Scurry Triathlon involves a 2 mile Paddle, a 19 mile bike ride and a 5k run. There will be Solo, Tandem, Relay divisions. Corporate Relay and 19U divisions. For more details check out www.blacksquirrelscurry.com Proceeds benefit Northwood’s Veterans Post and Friend of the River Bend Trail. Kentuck Klassic Car Show July 28th 9am-4pm 302 S Lake Ave., Crandon. Car show held in conjunction with Kentuck Day Festival, a celebration of the area’s early settlers. For more information, please call 715-478-3450. AquaRama Revival Run July 28th 9am-Noon Torpy Park, Hwy. 51, Minocqua. A 5K & 1 Mile Kids Fun Run sponsored by the Minocqua Lions Club The 5k route will take you on a loop course alongside beautiful Lake Minocqua & the Bearskin Trail. The Kids Fun Run will take place down & back style on the Bearskin Trail! Kids will love the excitement of a run to see one of the local fire trucks at the halfway point! They will also get to run alongside some of the community’s best volunteer fireman in their turn-out gear! Upon completion of the run, fun run participants will receive a prize & an opportunity to explore the fire trucks & talk to many representatives from the local fire departments! Adults will be awarded based on age group finishing with complimentary snacks & beverages to follow! Race Fees: Kids 10 & under $12, Students 18 & under $20/$25 (after June 16th), Adults 18 & older $30/$35 (after June 16th). For more information, please call 715-892-0462 or go to www.minoqua.org. Forest Fest July 28th 9am-3pm Trees for Tomorrow, 519 Sheridan St., Eagle River. Activities will include logging equipment, forest tours, chainsaw carvers, woodturners, trappers, timbersports, artisans & crafters, children’s activities, various forestry organizations, horse-drawn wagon rides, live music & entertainment, food, & so much more! For more information, please call 715-479-6456 or go to treesfortomorrow.com. Kentuck Day Festival July 28th 10am-4pm Forest County Courthouse Square, 200 S. Lake Avenue, Crandon. A celebration of some of the area’s early settlers from Kentucky, featuring arts & crafts show and sale, history display, car show, live music, food, horse-drawn wagon rides and flea market. For more information, please call 715-478-3450. 30th Annual Embarrass Volunteer Fire Department Fun Daze Celebration July 28th Embarrass River ATV Park, 1100 Quad Park Ln., Tigerton. There will be a parade at 11am. There will also be volleyball, kickball, live music, a craft & flea market, food and refreshments available. Contact John at 715-823-2033 for more information. Annual Trump Lake Association Golf Outing July 28th 11am Nicolet Country Club, 5245 Fairway Court, Laona. Golf outing with 5pm potluck picnic at the Lake Pavilion, Trump Rd., Wabeno. 8th Annual Wienerfest North July 28th 11am-7pm Lakewood Pavilion, North Rd., Lakewood. All profits benefiting troops & veterans. Honor guard presenting colors at noon. Meat raffles Noon – 4pm. Happy Schnapps Combo 4-7pm. Miller Team providing contests for the adults. Food & beverages. Try some of Meatski’s famous wieners. Entertainment for the kids. Come & help support our troops & veterans! For more information, please contact Sandy Larson at 715-276-2582. Pelican Lake Property Owners Meeting, Picnic & Fireworks July 28th Noon Schoepke Town Hall, Pelican Lake. For more information, please call 715-487-5222 or go to pelicanlakewi.org. 14th Annual Lac du Flambeau Lions Brewfest July 28th 1-5pm Torpy Park, US Highway 51 N, Minocqua. Situated on beautiful Lake Minocqua & historic Torpy Park pavilion. Sample craft, specialty & micro-brewery beers. Enjoy live music, purchase merchandise & cash raffle tickets. Have the Lion’s famous brats, hot dogs & burgers. Ages 21 & over admitted with ticket. Designated drivers & children admitted free. All proceeds go to Lions Eye Bank, Lions Camp & numerous local charities. For more information, please call 715-588-3414 or go to lacduflambeaubrewfest.com. Antigo Gateway Squares – Square Dance Club July 28th 3-4pm Langlade County Fairgrounds – Midway Music Tent, 1633 Neva Rd., Antigo. The caller will be Dave Schulz. For more information, please call 715-623-2128 or 715-598-2907. 1 Mile Lobster Crawl Fun Run/Walk July 28th 3-5pm Cenotaph Park, 301 Grand Ave, Merrill. Onsite registration. Prizes for fastest male and female finishers and a costume contest! There will also be a live DJ and a raffle. Admission is $5 per person. St. Florian Parish Picnic 2018 July 28th & 29th 4pm start on Saturday. St. Florian Parish, 500 Church Ln., Hatley. (Hwy. 29 E, exit 185) At 4pm on Saturday, there will be an outdoor mass with Kylie Resch & Shepherd’s Holler, at 5:30pm there will be bingo, and from 8pm to midnight will be music by the Jerry Schmitt Band. There will also be games, food & refreshments, raffles and a country store from 5pm to midnight. On Sunday, at 10:30am there will be an outdoor mass with Maroszek Bros. Band, then from 11am to 2pm there will be a home-cooked chicken dinner. Also, starting at 11:30am there will be food stands, games, raffles, refreshments, a petting zoo and the country store will be open. The cost of the chicken dinner is $11 for adults, youth (6-12) $5 and under 5 will be free. For more information, go to www.stflos.org. 4th Annual Lobsterfest July 28th 4-8pm Ballyhoo’s, 124 North Prospect Street, Merrill. This event is a fundraiser for the Tavern League to raise money for the Safe Ride Home Program. Tickets must be purchased before the event, so we can make sure we have your lobster. One Lobsterfest ticket is good for a one-pound live Maine lobster, buttered potatoes, corn on the cob, cole-slaw, dinner roll, and dessert buffet. Drink specials will be available. For those that do not want lobster, the Ballyhoos menu is also open and a prime rib special will be running. Coyote DJ will be on-site. Other activities include door prize give-aways, raffles, and a bounce house for the kids. Annual Timber Shrine Benefit Water Ski Show July 28th 8pm Kwahamot Bay, on the Wisconsin River across the street from The Bridge Motel on North 4th Street in Tomahawk. For more information, please call 715-612-3223. 50th Annual Arts & Craft Fair July 29th 10am-4pm Mielke Arts Center, N5649 Airport Rd., Shawano. Featuring more than 100 artisans & crafters setting up booths in the wooded areas surrounding the Mielke Arts Center. Concessions are available. For more information, please call 715-526-2525 or go to shawanoarts.com. Pickerel-Pearson Business Association Golf Outing July 30th 1pm Quig’s Maplewood Golf Course, N9240 Hwy. 55, Pickerel. Come out to the golf course for a day of fun with the Pickerel-Pearson Business Association members. For more information, go to pickerel-pearson.com. Music in the Park – Foxfire (Country) July 30th Food & pies starting at 5:30pm; concerts start 6:30pm. City Park West, 700 block of Aurora St., Antigo. Bring your lawn chairs & listen to the Music in the Park! Concerts held every Monday & Thursday, June-August. In the event of severe weather, concerts are held at the Heinzen Pavilion in Peaceful Valley. Free admission. For more information, please call 715-627-1014. Antigo Library Board Meeting July 24th 5-7pm Antigo Public Library, 617 Clermont St., Antigo. Hotel/Motel Room Tax Commission Meeting July 25th 8:30am City Hall, 700 Edison St., Antigo. Antigo Optimist Club Meeting July 25th 12-1pm North Star Lanes, 400 Prosser Place, Antigo. Public Works Committee Meeting July 25th 5:30pm City Hall, 700 Edison St., Antigo. Committee of the Whole Meeting July 25th 6:15pm City Hall, 700 Edison St., Antigo. Baby & Me Group July 23rd & July 30th 1:00pm-2:00pm. Langlade Hospital, 112 East Fifth Avenue, Antigo. Langlade Birthing Center, second floor of the hospital. Facilitator: RN/International Board Certified Lactation Consultant. For more information please call 715-623-9280. No fee. AA Support Group (Open) July 26th & July 28th 7:00pm. Langlade Hospital, 112 East Fifth Avenue, Antigo. Langlade Hospital Conference Room 1022, adjacent to Chapel in the new hospital. Thursdays & Saturdays. Narcotics Anonymous July 27th 7:00pm. Langlade Hospital, 112 East Fifth Avenue, Antigo. Langlade Hospital Conference Room 1022, adjacent to Chapel in the Langlade Hospital. Overeaters Anonymous July 23rd & July 30th 7:00pm. St. Mary & Hyacinth Parish Center, Room 4, 819 3rd Avenue, Antigo. Mondays at 7:00pm. Weight Watchers Meetings July 24th 6:45am & 5:30pm United Methodist Church, 2034 5th Ave., Antigo. T.O.P.S. (Take Off Pounds Sensibly) Support Group Chapter #950 July 24th 4pm Antigo Community Church/School, 723 Deleglise St., Antigo. T.O.P.S. (Take Off Pounds Sensibly) Support Group July 26th 5pm Steffen Memorial Home, 503 5th Ave., Antigo. Alzheimer’s Support Group July 26th 1:30-3pm Langlade County Senior Center, 1225 Langlade Rd., Antigo. This Alzheimer’s Association caregiver support group will meet the 4th Thursday of each month. Kathy Boksa is the group’s facilitator. The meeting is open to all area families & caregivers. There is no charge. For more information, please call Kathy at 715-350-4210. HALOS-Helping Another grieve a Loved One’s Suicide July 26th 6:30-9pm NTC Antigo Campus-Wood Technology Center, 312 Forrest Ave., Antigo. We are a new support group for anyone who has felt the devastating effects of a friend’s or loved one’s suicide. Meetings to be held the fourth Thursday each month in Room WT119 of the Wood Technology Center at NTC Antigo Campus. For more information, contact Tara at 715-219-5958.